We recently posted a blog about an Instagram account called Vintage Somalia, which posts old photos taken in the country pre-civil war. During the rampage across the net that brought us to Vintage Somalia, we discovered another story hailing from the east African country. So for this blog, we’re going to tell you about Asli Hassan Abade, the first female military pilot in Africa. Asli has popped up in news reports as of late due to a recent trip she took to Somalia over summer from her current home in Texas. If that sentence alone doesn’t make you want to hear her about her life’s journey, then you must be very hard to impress. For everyone else, read on. Born in 1958, Asli grew up with her parents and nine siblings in a house near to Mogadishu airport. She believes that a childhood spent watching planes take off and land developed her ambition to become a pilot. But first, a little history. After Somalia gained independence in 1960, they established or reformed various branches of their national military, including the Somali Air Force (SAF). With a little help from the Soviets, the Somali military grew in expertise and strength – at one point, they had the greatest airstrike capability in the Horn of Africa. In 1969, the Somali army seized power in a coup, declaring the nation a socialist state. A push for rapid modernisation followed, including extensive efforts to bolster the military. For the SAF, this meant numerous pilots were sent to train in the United States, the UK, the Soviet Union and Italy. This is where we neatly hop back to Asli. 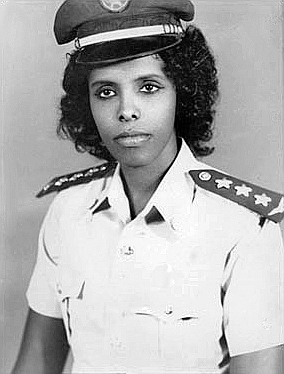 Asli in her Somali Air Force days, 1970s. Credit: Wikimedia Commons. Soon enough, Asli left for Italy to train as a pilot, before returning to her homeland to join the Somali Air Force. She started flying planes for the SAF in 1976. She is the first – and so far only – female pilot in the Somali air force. She is also thought to be the first female pilot in any African country’s military. After 10 years in the SAF, Asli settled in Texas with her new husband, an American aircraft engineer she met during her service. Although she has largely remained in Texas since, Asli flew back to Mogadishu in 2011 to deliver medical supplies to the Forlanini (Lazaretto) Children’s Hospital during the most devastating famine to hit the country in years. At the time, Somalia was not only experiencing a humanitarian crisis, it was besieged by terror group Al-Shabaab. Their presence meant Asli could only stay in the capital for 24 hours. When the 59-year-old mother of four returned this summer, things were very different from 2011. ‘I did not have the liberty to move around Mogadishu like I am doing now, or talk to the media,” she explained to UNSOM. Asli has clearly noticed the significant improvements in Somalia over the past six years. She now wants to offer her experience, skills and advice to the younger generations who are working to ensure the country achieves a more peaceful and prosperous future.